Just two weeks ago, in a column on sire lines represented at the Keeneland September sale, we noticed that the Byerly/Herod line was a big fat zero -- not a single foal offered. But, then, really not surprising, since the line has long been dormant in North America. Well, since then another headline has hit the news that concerns the Byerly/Herod sire line: an article early this week on BloodHorse.com announced that Legal Jousting Sires First Winner. Legal Jousting (IRE) is a son of Indian Ridge (IRE) and traces back in tail-male to Herod through My Babu. I wrote a short article for BloodHorse.com and TBH MarketWatch that you might like to read if you're interested in the Thoroughbred breed's least common sire line: Byerly, Back in Business. The Thoroughbred foundation sire Byerly Turk is correctly spelled thusly. The omission of the penultimate "e" from the name of Captain Robert Byerley, for whom the horse was called, was apparently an error of the early General Stud Book. I mentioned in the article that the 1982 edition of the Stallion Register shows active stallions through four different sons of the Herod-line sire Tourbillon. They are: Ambiorix (1946), Coaraze (1942), Djebel (1937), and Timor (1944). I know that Djebel is alive through at least a couple of branches and I believe there are Ambiorix lines out there tracing to Good Behaving and Boitron. Anyone know of extant branches of Coaraze or Timor? Referring back to that 1982 Stallion Register was not random -- it was the first one I found with the now-standard sire line descent charts. Amazing what 20-odd years will change... not even looking at the myriad Eclipse lines (perhaps another time! ), it was fun to see Herod showing a bit of strength and the Matchem line in full force. Matchem's fourth-great-grandson Melbourne was still shown with two branches including one that descended down through Solon to Sassafras and sons (a line still exists but is quickly fading and has no "commercial" representatives today). In the more familiar West Australian branch of Melbourne, Man o'War had both War Admiral and War Relic represented. And Intentionally was represented by In Reality and Tentam (as he is today) -- but also by Aforethought, a full brother to Ta Wee. 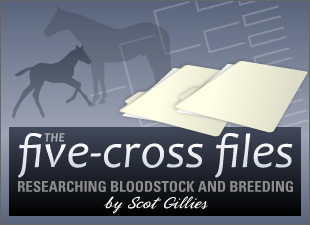 More information on Modern Thoroughbred Sire Lines can be found by following the link!